Make Medicine Hat your basecamp to outdoor adventures and sleep under the stars with campgrounds and RV parks a short drive from the city. Whether it be rustic backcountry or convenient glamping - experience Southeast Alberta with these 6 great campgrounds and RV Parks in and close to Medicine Hat. Wake up to the morning sunshine and bird song in secluded settings. Feel like you are the only ones around for miles. Get a taste of adventure in the comfort of a cabin. Horseshoe Canyon is a mere 200 metres away along a wooded path. Standing there, at 1,400 metres elevation the hills and trees melt away below your feet, exposing Alberta’s endless prairie. Epic weekend of mountain bike racing, live music and great food in Elkwater, Cypress? Battle Creek Showdown is happening August 24! Pro Tip: On a clear day, you can even see Medicine Hat on the horizon, 80 kilometres away as the crow flies. The South Saskatchewan river valley at Sandy Point is the Canadian Badlands at its finest. You approach it after 100 kilometres of rolling Alberta prairie, which is hypnotic and remarkable in its own right. Suddenly ranchers’ fields and virgin prairie drop away as you descend into the valley. Along the riverbank is a sleepy little campground, a great place to spend the night. 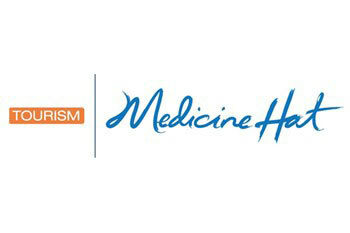 The Medicine Hat Gran Fondo is returning on June 8, seeing cyclists challenge themselves on several routes outside of the city. Pro Tip: Use it as a base or finishing point for canoe trips or fishing, with dozens more miles of badlands hoodoos for your eyes only. 40 Mile Park is set along a reservoir and has become one of Southern Alberta’s most popular boating, fishing, and RVing spots. The sites are big, the boat launch can handle dozens of vehicles, and the reservoir is big enough for everyone to get on the water. The Great Big Pedal in Medicine Hat brings as many pedal bikers as possible together on July 4 to go on a bike ride together. Pro Tip: While water sustains the livelihood of Southern Alberta’s hardworking people, the canal system that diverts all that water also provides recreation opportunities for everyone. Perched high above the South Saskatchewan River, just minutes by foot from one of the best views of Medicine Hat’s river valley is Gas City Campground. It is also the starting point for a path that tracks the bench above the South Saskatchewan River to Echo Dale Regional Park, a long walk or nice bike ride for any family looking to spend a day together. Bring your canoe, kayak, stand up paddle board, or other floating device for the Great Big Paddle in Medicine Hat July 13. Pro Tip: The fully treed, 97-site, full-service campground is only minutes from the Transcanada Highway. For those looking for peace and quiet at what feels like their own private fishing hole, Cavan Lake is an oasis. Ideal for the fisherman or anyone looking to set up camp and relax, you can choose from large sites in well-treed loop surrounding a playground and open park. Sunshine Skillet Culinary Festival is May-long weekend and filled with incredible smells, local culinary experiences, and a three part cooking demo during the First Farmers Market of the year! Pro Tip: Take a site with a view of the small prairie lake and watch the sunrise with coffee in hand. A remarkable setting for a stress-free stay, Redcliff Campground is two blocks from the town’s downtown, offering the opportunity to restock supplies. For convenience and price, few places can compete with Redcliff Campground. That pounding of hooves and trembling of the ground can mean only one thing; World Pro Chuckwagon Races happening June 13 - 16 in Medicine Hat! Pro Tip: Next to the campground are Redcliff baseball diamonds, toss around a ball if it’s not too busy in the summer with slowpitch tournaments.